The Beatles Coffee Shop near the Abbey Road crossing. 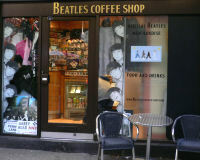 Description: Formerly known as the Abbey Road Cafe, The Beatles Coffee Shop is run by Beatles Tour Guide Richard Porter. It's a small cafe just inside the nearest tube station to Abbey Road, but there is some outdoor seating. As well as food and drink they sell a range of Beatles souvenirs. It's the perfect way to wind down after paying homage to your heroes by walking in their famous footsteps along the Abbey Road crossing.